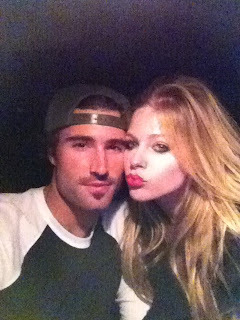 Brody Jenner and his GF Avril Lavigne were at the Hollywood Roosevelt Hotel last night. Around 1:00 AM Avril and some broad got in a scuffle. Brody tried to jump in an intervene and had a beer bottle broken over his head. It doesn't surprise me that Avril was the one that was getting into a fight. That girl has some rage issues that she needs to work out in some other way than wearing skulls and dipping her hair in kool-aid. TMZ was reporting that everyone involved except Brody had ditched by the time police got there...including Avril. So classy. Your boyfriend gets smashed over the head with a bottle in your defense and you leave him. Shameful.